Giving back to our soldiers and veterans was the primary driving force behind the launch of K-9 Caring Angels. For their service and sacrifice and the challenges that sometimes follow our Service Dogs are there to help with forward momentum. K-9 Caring Angels are proud to have launched a full time in-house Therapy Dog pilot program with Fairfax County Fire and Rescue. To date 3 dogs are in place as we observe and evaluate the effectiveness of the program and examine what is working well and what needs tweeking. Another pilot program launched with the Fairfax JDC we introduced the Puppy Squad, future, potential service and therapy dogs. 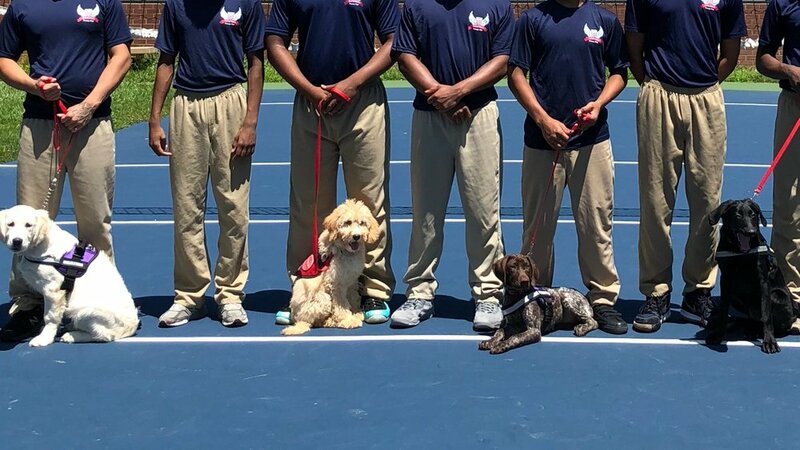 We worked with students there to teach dog training, care and behavior during a 6 week program to promote learning, skill development, understanding, empathy, confidence and accomplishment.